Cervical spinal stenosis is the narrowing of the space for the spinal cord or nerve branches. More specifically, as the spine degenerates over time, it can lead to the formation of bone spurs. As the bone spurs form, the size of the spinal canal (bony tunnel transmitting the spinal nerves) becomes smaller. The bone spurs press on the spinal cord or the nerve roots, often causing pain or weakness. This degenerative condition is associated with spondlylolisthesis (slipping forward of one vertebra relative to another) and scoliosis (crooked spine). More than 1.2 million Americans suffer back pain stemming from spinal stenosis, with men and women being affected equally. Women, however, are more likely to have symptoms that require treatment. While cervical spinal stenosis can affect younger patients, it is most common in those 60 and older. Arthritis is the most common cause of cervical spinal stenosis. What Are the Symptoms of Cervical Spinal Stenosis? Loss of position sense, meaning the inability to know what position arms are in if they are not visible. What Are the Causes of Cervical Spinal Stenosis? The natural aging process is far and away the main cause of spinal stenosis. Osteoarthritis is the most common cause of cervical spinal stenosis. 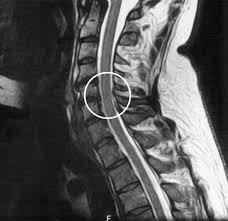 The gelatinous discs that cushion the vertebrae in the spine begin to dry out as we age, resulting in shortened disc height. This puts pressure on the facet joints. As they feel more pressure, they too deteriorate, leading to arthritis. The arthritis can cause the ligaments around the joints to thicken and enlarge, decreasing space in the spinal canal for nerves to pass through. The cartilage that protects joints wears away as well. Too much wear leads to bone-on-bone rubbing. To compensate for the missing cartilage, the body may grow bone in the facet joints. Bone overgrowth is called spurs, and their formation further contributes to the narrowing of space in the spinal canal for nerves to pass through. Once the space within the spinal canal becomes too cramped, pain can ensue. Metabolic conditions such as Paget’s disease or fluorosis, an excessive level of fluoride in the body. What Are the Treatments for Cervical Spinal Stenosis?